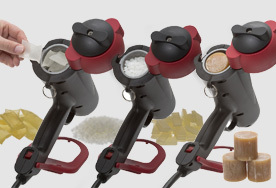 Pneumatic hand held glue guns for bulk adhesives (Pillows, Slats, Granules) and shaped (43mm) hot melt adhesives. 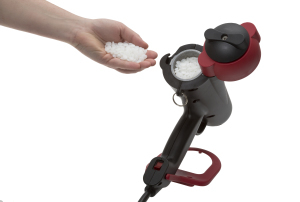 Tec 4500B (BEAD) and Tec 4500S (SPRAY) glue guns have been specially designed to allow the operator to use a wider variety of bulk (granules, pillows, slats) and shaped (43mm) hot melt adhesives. These new glue guns boast everything you would usually expect from a Tec Glue Gun: durability, reliability, high performance and covered by a 12 month warranty. 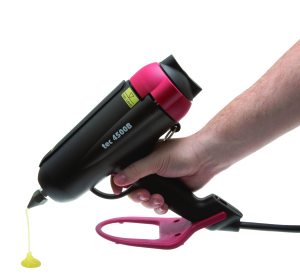 Now you can apply a FULL pressure sensitive adhesives via a Tec glue gun and both tools dispense most other forms of bulk hot melt adhesives. Applications where the bulk adhesive has been specified. 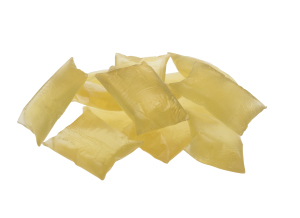 The built-in melt chamber and pre-set temperature allows the Tec 4500 glue guns to take EVA, polyolefin or pressure sensitive adhesives in granular, slats or pillow forms and also 43mm glue slugs. 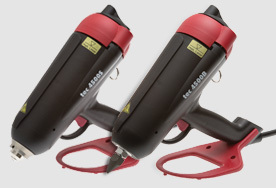 Powered by a 600 watt heater the Tec 4500 tools offers the quickest glue melt down with Tecbond 43mm glue slugs. You can dispense up to 2.5 kilos of molten 43mm glue per hour and up to 1 kilo of molten granules, slats and pillows per hour.